A new product from *BharathNet Lab released! 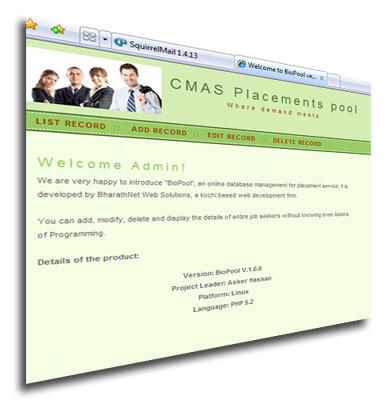 An online database management programe for placement service providers and Job Portals. We named this software “JobPool” which stands for the pool of job seekers. It is fast and flexible. You can add, modify, delete and display all the details in a descent manner. No need of programming knowledge. You can grab this product at just Rs.12500 as an introducery offer. No need to make annual payment. Just pay Rs.12500 and get 1 years updates absolutely free. *BharathNet Lab is the programming team working under BharathNet.com, a Kerala based web hosting company at Kochi.